In 1981 Brodie Lockard, a Stanford University student, developed a computer game just two years after a serious gymnastics accident had almost taken his life and left him paralyzed from the neck down. Unable to use his hands to type on a keyboard, Lockard made a special request during his long recovery in the hospital: He asked for access to a PLATO terminal. PLATO (Programmed Logic for Automatic Teaching Operations) was the first generalized computer-assisted instruction system designed and built by the University of Illinois. The computer game Lockard started coding on his PLATO terminal was a puzzle game displaying Chinese Mah-Jongg tiles, pieces used for the Chinese strategy game called «Mahjongg» that had become increasingly popular in the U.S. Lockard accordingly called his game «Mah-Jongg solitaire». In 1986 Activision, one of the early game companies, released the game under the name of «Shanghai» (see screenshot), and when Microsoft decided to add the game to their Windows Entertainment Pack für Win 3.x in 1990, this time under the name of «Taipei», Mah-Jongg Solitaire became one of the world's most popular computer games. The project «Letterjongg» aims at translating the far-east Mah-Jongg imagery into late medieval typography. 570 years ago the invention of the modern printing technology by Johannes Gutenberg in Germany (and, two decades later, by William Caxton in England) was massively disruptive. Books, carefully bound manuscripts written and copied by scribes in weeks, if not months, could all of a sudden be mass-produced in a breeze. The invention of moveable types as such, along with other basic book printing technologies, had a huge impact on science and society. 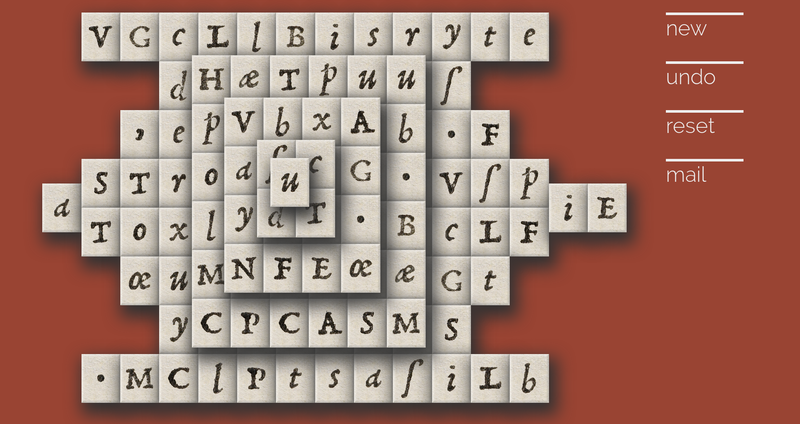 Letterjongg comes with 144 typographic tiles (hence 36 tile faces). The letters have been taken and isolated from a high resolution scan (2,576 × 4,840 pixels, file size: 35.69 MB, MIME type: image/tiff) of Aldus Pius Manutius, Horatius Flaccus, Opera (font design by Francesco Griffo, Venice, 1501). «Letterjongg» has been slightly simplified. Nevertheless it is not easy to play as the games are set up at random (actually not every game can be finished) and the player's visual orientation is constrained by the sheer number and resemblance of the tiles. Starting from the sides, or from the central tile at the top of the pile, remove tiles by clicking on two equal letters. If the tiles are identical, they will disappear, and your score will rise. Removeable tiles always must be free on their left or right side. If a tile sits between two tiles on the same level, it cannot be selected.